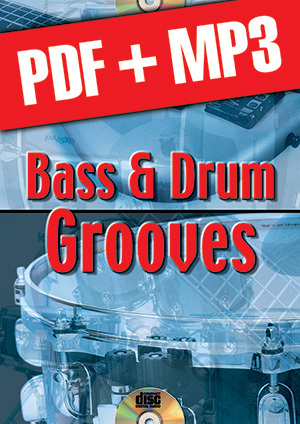 Bass & Drum Grooves (pdf + mp3) (DRUMS, Course downloads, P. Safran & D. Johnson). This method is designed for both the drummers and bassists and its purpose is to help them play together in almost all major musical styles: Rock, Blues, Funk, Rhythm and Blues, Disco/Dance, Reggae, Latin music, etc... The many grooves presented here, even if they can be practised alone, are intended to be played in a band, or at least by a bass/drum duo, either on stage or in a studio or simply among friends. Each example displays the bass line along with its tab and the drum score just below allowing to situate each instrument in relation to the other. In this way, the grooves can easily be read and analysed from both perspectives. For each style, you will begin practising one bar, then two bar patterns... before tackling longer and more complex grooves. To put this into application, all you will have to do is use your own chord changes or those you like, as well as play the patterns you find interesting over these chords. On the CD, the bass examples are played on the left channel and the drums examples on the right channel. With a centred sound balance you will be able to hear both instruments !